Experience Pearl Harbor with your group of 1 to 3 people at your own pace and guidance of your private driver, who picks you up at your Oahu hotel at a time that works best for your group. Skip the line at the Arizona Memorial and visit the Pacific Aviation Museum, and also have ample time to explore inside the Pearl Harbor Visitor Center. On the ride back to your Waikiki hotel, see popular Honolulu sights on a driving tour through town. Arrange for your chauffeur to pick your group of 1 to 3 people up at a time that works best for your group, and then drive to Pearl Harbor in luxurious comfort to begin the half-day long tour. Upon arrival at Pearl Harbor you'll be met by a coordinator who will offer you water and fresh, tropical juice. You'll receive your entry vouchers for the day, and get an orientation about the different sights that you'll visit. 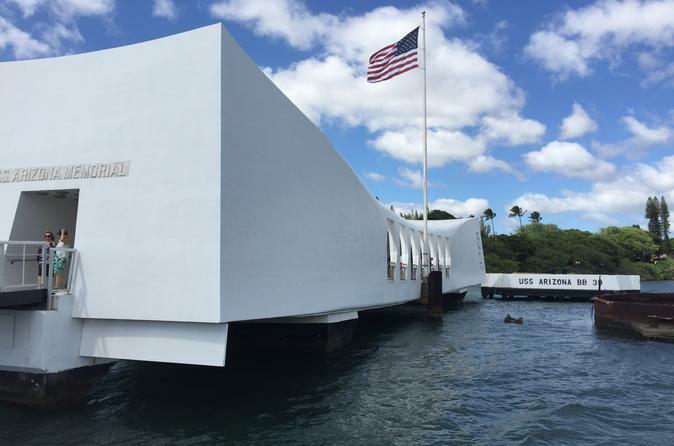 Explore the Pearl Harbor Visitor Center to look at photos and displays, before going to pay your respects to the fallen at the Arizona Memorial. You won't need to wait in the line for the boat, as this package allows you to skip the line to the Arizona Memorial. You'll also visit the Pacific Aviation Center to tour the collection of airplanes, and see all the different models that were used in fighting during World War II. See film footage of the Japanese attack that killed thousands of US sailors, and when visiting the Pacific Aviation Center, you'll also receive a complimentary headset that narrates the tour as you go. At the end of your visit inside Pearl Harbor, you'll meet back up with your private chauffeur for a drive through Honolulu. Pass by the statue of King Kamehameha, the state Capitol, and 'Iolani Palace, which is the only royal palace located anywhere on US soil. After driving the streets of Honolulu, your tour officially comes to an end when you're driven back to your hotel.